The movies have always been in love with themselves. For all their heroes and villains, lost loves and epic stories, Hollywoods greatest source of mythology has always been its own history. Almost from the birth of the medium, movies have explored the filmmaking process and satirized their own development, acting out existential investigations that let the viewer in on the joke while keeping them at arms length. By taking place inside the machinery of filmmaking, the narratives seem to offer a glimpse of the real Hollywood, but the finished product is still, itself, a movie, and its representation of reality is always going to be heightened and enhanced to keep the audience entertained. Theres a constant tension at the heart of these films. The more they try to pull back the curtain, the harder it is to see whats really behind it. Hollywood got an early start on self-awareness. Hollywood and Souls for Sale, both silents from 1923, as well as 1928s silent Show People, are comedies set in the nascent world of film production that are stuffed with cameos from stars of the era. More incisively, theres 1924s Merton of the Movies, which originated on Broadway and told the story of an aspiring actor with a penchant for overwrought, hammy acting, so much so that a studio casts him in a comedy but tells him hes filming a drama. Right there, youve got the star-making process, the average persons thirst for fame, and the duplicitous ways that suits conduct business, all played for knowing laughs. Almost a century later, the story hasnt really changed. Yet whats become so fascinating about these kinds of movies is that as film history marched on, it became possible to fold real films into the fictional narratives, and for actors playing characters to reference other actors by their real names. Little winks like that pop up everywhere Lauren Bacall in How to Marry a Millionaire talking about that old fella, whats his name, in The African Queen; Cary Grant name-checking Ralph Bellamy in His Girl Friday, in which Bellamy also starred but they take on new meaning when they happen in movies that are themselves about the filmmaking process. Characters making movies talk about real-world pictures that we, the viewers, have seen. Its a way to bolster the credibility of their fictionalizations, but it also makes for a pleasantly disorienting experience. Instead of pure suspension of disbelief and pretending that, say, Tom Hanks doesnt exist in Tom Hanks movies, we watch actors invoke their real-life colleagues in ways that blur reality. The films create a world that might be called Alternate-Universe Hollywood: recognizably our own, yet unavoidably foreign. There are plenty of ways to do this, from the absurdity of Tropic Thunder to the existential dread of The Player, but two comedies from the 1990s stand out for their charm and precision: Get Shorty and Bowfinger. Individually theyre great funny, quick-witted, entertaining but theyre also prime examples of how to tell an Alternate-Universe Hollywood story that feels as strong twenty years later as it did the day the print was struck. 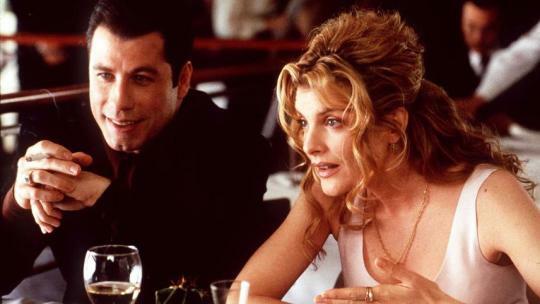 Get Shorty was released in 1995, five years after the Elmore Leonard novel that inspired it. The story follows loan shark and film buff Chili Palmer (John Travolta) as he pursues a debtor to Los Angeles and decides to become a movie producer. Like most movies about movies, its a love song to the idea of Hollywood-as-dream-factory: Chilis eyes sparkle when he talks about the classics, and he starts to win over his love interest (Rene Russo) at a screening of Touch of Evil. There are even moments that quote 1932s Cabin in the Cotton. But modern Hollywood is dealt with more vaguely: while established stars who gained fame in the 1970s and 1980s are mentioned, specific films from recent years are only alluded to in a general way. Take Chilis pontification on whether he could step in front of the camera: I can see myself in the parts that Robert De Niro plays, or maybe an Al Pacino movie, playing a real hard-on. I couldnt see myself in a movie where like the three guys get left with a baby, they don’t know how to take care of it, so they act like assholes. Hes talking, of course, about 1987s Three Men and a Baby. But that film was only a few years old when Get Shorty was released, and as a result, bringing it up runs the risk of making the film feel dated, tied to the period in a way thats ironically less likely to happen by name-checking films from decades prior. Its partly because classic films have had time to let their reputations grow, evolving into a canon everyone can invoke. Newer films, though, dont have that luxury. Theres also a reason Chili doesnt say the films title but does describe its plot. Its an example of whats known as distancing language, which is when generalities are used to place a subconscious distance between the speaker and the object in the mind of the audience. It pops up about every week in politics: I did not have sexual relations with that woman might lack grace, but it still plays better than I didnt sleep with Monica. The phrase that woman is a distancing one, and phrases like that manage to simultaneously evoke something specific without actually bringing it all the way into the room. So when Chili all but says its a movie about three men and a baby, hes able to call the picture to mind for viewers, but not in such a way that Get Shorty becomes irrevocably linked to it. The film floats along on the surface of its era. The movies have always been in love with themselves. For all their heroes and villains, lost loves and epic stories, Hollywood’s greatest source of mythology has always been its own history. Almost from the birth of the medium, movies have explored the filmmaking process and satirized their own development, acting out existential investigations that let the viewer in on the joke while keeping them at arm’s length. By taking place inside the machinery of filmmaking, the narratives seem to offer a glimpse of the “real” Hollywood, but the finished product is still, itself, a movie, and its representation of “reality” is always going to be heightened and enhanced to keep the audience entertained. There’s a constant tension at the heart of these films. The more they try to pull back the curtain, the harder it is to see what’s really behind it. Hollywood got an early start on self-awareness. Hollywood and Souls for Sale, both silents from 1923, as well as 1928’s silent Show People, are comedies set in the nascent world of film production that are stuffed with cameos from stars of the era. More incisively, there’s 1924’s Merton of the Movies, which originated on Broadway and told the story of an aspiring actor with a penchant for overwrought, hammy acting, so much so that a studio casts him in a comedy but tells him he’s filming a drama. Right there, you’ve got the star-making process, the average person’s thirst for fame, and the duplicitous ways that suits conduct business, all played for knowing laughs. Almost a century later, the story hasn’t really changed. Yet what’s become so fascinating about these kinds of movies is that as film history marched on, it became possible to fold real films into the fictional narratives, and for actors playing characters to reference other actors by their real names. Little winks like that pop up everywhere — Lauren Bacall in How to Marry a Millionaire talking about “that old fella, what’s his name, in The African Queen”; Cary Grant name-checking Ralph Bellamy in His Girl Friday, in which Bellamy also starred — but they take on new meaning when they happen in movies that are themselves about the filmmaking process. Characters making movies talk about real-world pictures that we, the viewers, have seen. It’s a way to bolster the credibility of their fictionalizations, but it also makes for a pleasantly disorienting experience. Instead of pure suspension of disbelief and pretending that, say, Tom Hanks doesn’t exist in Tom Hanks movies, we watch actors invoke their real-life colleagues in ways that blur reality. The films create a world that might be called Alternate-Universe Hollywood: recognizably our own, yet unavoidably foreign. There are plenty of ways to do this, from the absurdity of Tropic Thunder to the existential dread of The Player, but two comedies from the 1990s stand out for their charm and precision: Get Shorty and Bowfinger. Individually they’re great — funny, quick-witted, entertaining — but they’re also prime examples of how to tell an Alternate-Universe Hollywood story that feels as strong twenty years later as it did the day the print was struck. 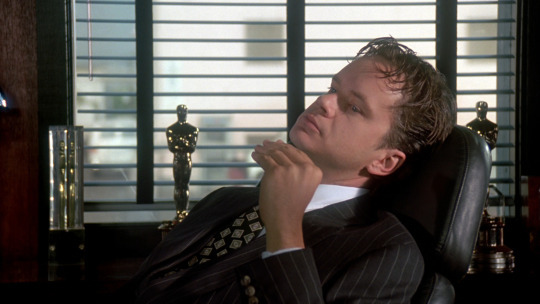 Get Shorty was released in 1995, five years after the Elmore Leonard novel that inspired it. The story follows loan shark and film buff Chili Palmer (John Travolta) as he pursues a debtor to Los Angeles and decides to become a movie producer. Like most movies about movies, it’s a love song to the idea of Hollywood-as-dream-factory: Chili’s eyes sparkle when he talks about the classics, and he starts to win over his love interest (Rene Russo) at a screening of Touch of Evil. There are even moments that quote 1932’s Cabin in the Cotton. But modern Hollywood is dealt with more vaguely: while established stars who gained fame in the 1970s and 1980s are mentioned, specific films from recent years are only alluded to in a general way. Take Chili’s pontification on whether he could step in front of the camera: “I can see myself in the parts that Robert De Niro plays, or maybe an Al Pacino movie, playing a real hard-on. I couldn’t see myself in a movie where like the three guys get left with a baby, they don’t know how to take care of it, so they act like assholes.” He’s talking, of course, about 1987’s Three Men and a Baby. But that film was only a few years old when Get Shorty was released, and as a result, bringing it up runs the risk of making the film feel dated, tied to the period in a way that’s ironically less likely to happen by name-checking films from decades prior. It’s partly because classic films have had time to let their reputations grow, evolving into a canon everyone can invoke. Newer films, though, don’t have that luxury. There’s also a reason Chili doesn’t say the film’s title but does describe its plot. It’s an example of what’s known as distancing language, which is when generalities are used to place a subconscious distance between the speaker and the object in the mind of the audience. It pops up about every week in politics: “I did not have sexual relations with that woman” might lack grace, but it still plays better than “I didn’t sleep with Monica.” The phrase “that woman” is a distancing one, and phrases like that manage to simultaneously evoke something specific without actually bringing it all the way into the room. So when Chili all but says “it’s a movie about three men and a baby,” he’s able to call the picture to mind for viewers, but not in such a way that Get Shorty becomes irrevocably linked to it. The film floats along on the surface of its era.